"The Frontier Garrison" is the first English translation of "Az előretolt helyőrség" by the Hungarian novelist Jenő Rejtő (1905-1943), originally published in 1939 under the pen name of “P. 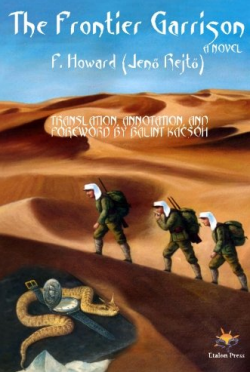 Howard.” The translator, Balint Kacsoh, also annotated the edition and wrote its preface. The preface provides biographical data of Jenő Rejtő in historical and literary context. The genre is fiction; elements of action, adventure, mystery, and comedy are mixed in the story. It is suitable for young readers and adults. Action and adventure are mixed with a healthy dose of offbeat humor in this P. Howard classic, set in the second half of the 1930s. Harrincourt is dishonorably discharged from the French Naval Academy for a prank. He realizes that his carefree behavior put the livelihood of his widowed mother and teenage sister in jeopardy. To secure their financial future, he pays the premium on his life insurance policy and joins the French Foreign Legion destined to Africa, where his death “in the course of professional duty” would be all but guaranteed. While in basic training in Oran, he unwittingly becomes mixed up in murder and espionage and encounters the ghost of a murdered woman who has a penchant for singing. An audiobook narrated by B.J. Harrison will be is expected to be available by May, 2014. B.J. Harrison also narrated the English translation of "Az Egri Csillagok" (Eclipse of the Crescent Moon) by Geza Gardonyi available on the AHF Amazon Store! 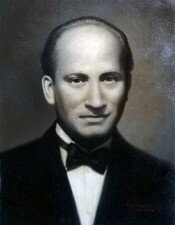 Jenő Rejtő (born Jenő Reich) was a prolific Hungarian journalist, novelist and playwright. He is best known for his books published under the pen name “P. Howard,” many of them set in the 1930s French Foreign Legion. For that reason, Rejtő is often remembered as the "Immortal Legionnaire." He was born in Budapest on March 29, 1905. During World War II, after being exposed as a Jew by a Nazi newspaper, he was drafted to the Hungarian Army’s labor service and dispatched to the eastern front in November, of 1942. He died on January 1, 1943 in Evdakovo, Russia (then under occupation by Axis forces) due to typhus infection. Although he had been initially dismissed as a pulp fiction writer, his books have survived the test of time. He is still one of the most widely read Hungarian authors who is popular among all age groups from preteens to the elderly. The staying power of his novels is primarily due to his memorable characters and offbeat humor. [See other books by Jeno Rejto] on AHF's Amazon store! AHF Freedom Circle Member Balint Kacsoh, MD, PhD, is a professor of anatomy, histology and cell biology, and physiology at Mercer Univiersity's Medical School in Macon, GA where he joined the faculty in 1992. He attended Budapest's Semmelweis University of Medicine and graduated with an M.D. in 1984. He earned a Ph.D. at the Hungarian Academy of Sciences in 1997 in Basic Medical Sciences - Physiology/Endocrinology. He and his wife, a pediatrician in private practice in Macon who is also from Hungary, came to the US in 1986 and hold dual citizenship. They have three children, the oldest already in university. He is the author of the medical book, "Endocrine Physiology" and most recently translated the first English translation of "The Frontier Garrison" or "Az előretolt helyőrség" by the Hungarian novelist Jenő Rejtő (1905-1943), originally published in 1939 under the pen name of “P. Howard.” He also annotated the edition. Rejto is perhaps the most popular and widely read fiction novelist in Hungary, entrenched in Hungarian popular culture. Buy buy his books on the AHF Amazon Store!